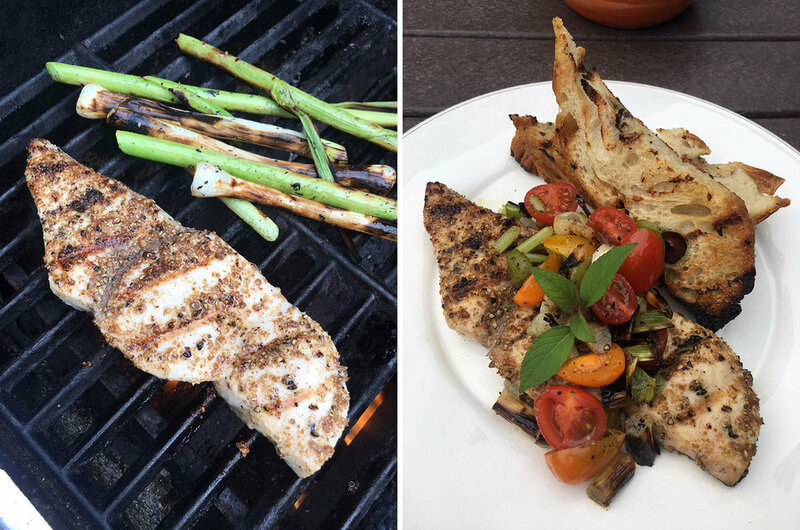 Grilled Black Pepper and Coriander Crusted Swordfish With Grilled Focaccia and Green Garlic-Tomato Salad — The Local Catch, Inc. - The Best Rhode Island Seafood! Preheat Grill. Remove skin from swordfish and rub steaks generously with olive oil. Season with salt on both sides. Mix coriander and black pepper together and heavily coat swordfish on all sides. Grill on one side until dark marks form. Flip to the other side and continue to grill until cooked through, approx. 5 more minutes. Toss green garlic and tomatoes in olive oil and lemon juice. Season with salt & pepper. Grill green garlic (whole) until soft, then chop into bite sized pieces and toss with tomatoes. If garlic is a little tough after grilling, place in a pan with a little broth and cook until soft to the bite. Brush focaccia slices lightly with olive oil and grill to mark on each side. Enjoy with swordfish and salad!